The Chinese People’s Liberation Army Air Force (PLAAF) sent four Xian H-6K long-range bombers, one Tupolev Tu-154MD electronic intelligence plane, and at least two fighter jets through international airspace between the Japanese islands of Okinawa and Miyako in the East China Sea on March 30 as part of a military exercise, Japan’s Ministry of Defense (MoD) said in a statement. According to the MoD, Japanese airspace was not violated. China has over the past years upped the operational tempo of long long-range patrols and air exercises around and over the Miyako Strait — a principal entryway for the People’s Liberation Army Navy (PLAN) into the Pacific Ocean. For example, in March 2018 a PLAAF formation that included H-6K bombers and Sukhoi Su-35 multirole fighter jets transited the Miyako Strait as part of a military exercise. According to the MoD, the PLAN also dispatched three ships to the Western Pacific on March 28 including two Type 054A Jiangkai II-class guided-missile frigates and an oiler from the PLAN’s East Sea Fleet. It is unclear whether the PLAN warships made contact with the PLAAF aircraft on March 30. Notably, People’s Liberation Army (PLA) doctrine reportedly mandates the sealing off of the Yellow Sea, South China Sea, and East China Sea from U.S. air and naval assets in a military confrontation with the United States and its regional allies. “In the event of a conflict with Taiwan or Japan, the Miyako Strait and Bashi Channel would be critical chokepoints, the seizure of which could delay third party intervention (e.g., by the United States) and secure the so-called first island chain,” I wrote last year. The Bashi Channel is a strategically pivotal waterway connecting the South China Sea with the western Pacific Ocean. 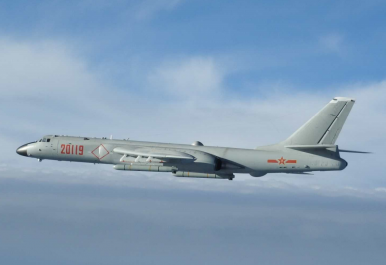 The March 30 scramble constitutes the Japan Air Self Defense Force’s (JASDF) first intercept of a PLAAF bomber formation over the East China Sea in 2019. H-6K bombers, a derivative of the Soviet-era Tupolov Tu-16, can carry up to seven YJ-12 supersonic anti-ship missiles (six on wing pylons plus one in the bomb bay) or CJ-20 subsonic land-attack cruise missiles with an estimated range of 400 and 2,400 kilometers respectively. [A previous] JASDF scramble against a Y-9JB aircraft took place on February 23, which constituted the first intercept of a Chinese aircraft following an eight-week hiatus. Another intercept of a PLAAF military aircraft near the Japanese islands occurred on December 27, when JASDF also intercepted a Y-9JB aircraft. A preceding intercept mission took place on December 14. Additionally, Japanese fighters also conducted scrambles against [People’s Liberation Army Air Force] PLAAF and [PLANAF] aircraft on November 26 and on October 29. Furthermore, intercepts occurred on August 29 and July 27, as well as in June when a Y-9JB, flying through international airspace between Okinawa and Miyako, was intercepted. Additionally, JASDF fighter jets scrambled to intercept a Russian Navy Ilyushin Il-38N “Dolphin” maritime patrol and anti-submarine warfare aircraft over the Sea of Japan on March 27. It was the second JASDF scramble against a Russian Il-38 maritime patrol aircraft in 2019.